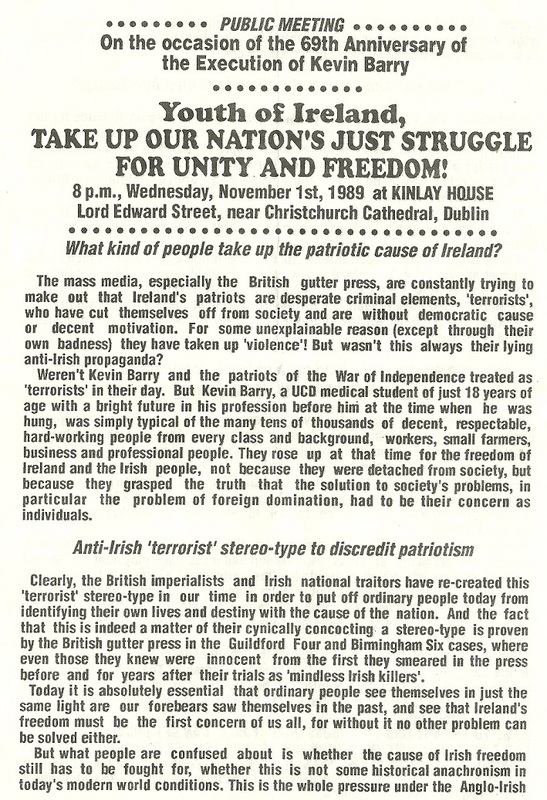 A 1989 leaflet from The Communist Youth Union of Ireland (Marxist Leninist) advertising a meeting ‘On the occasion of the 69th Anniversary of the Execution of Kevin Barry’. 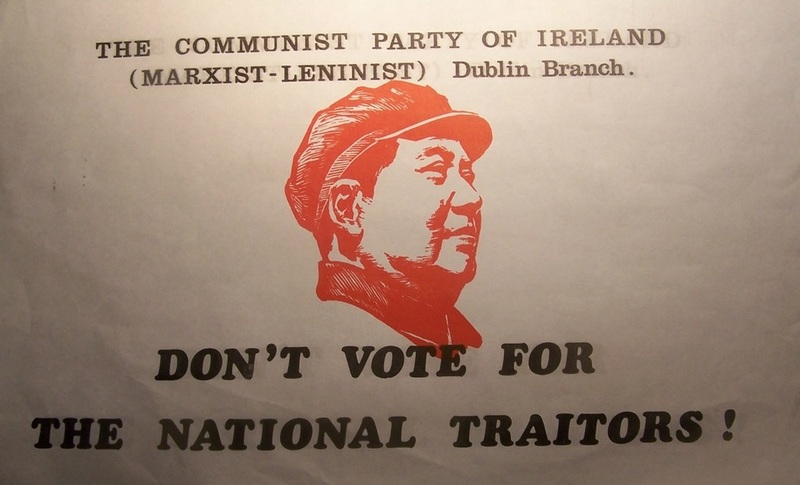 From 1970 a poster from the The Communist Party of Ireland (Marxist – Leninist) Dublin Branch with the slogan ‘Don’t Vote for the National Traitors’. I’m not quite sure if the ‘National Traitors’ were the CPI or just everyone else on the political spectrum to the CPI(ML). 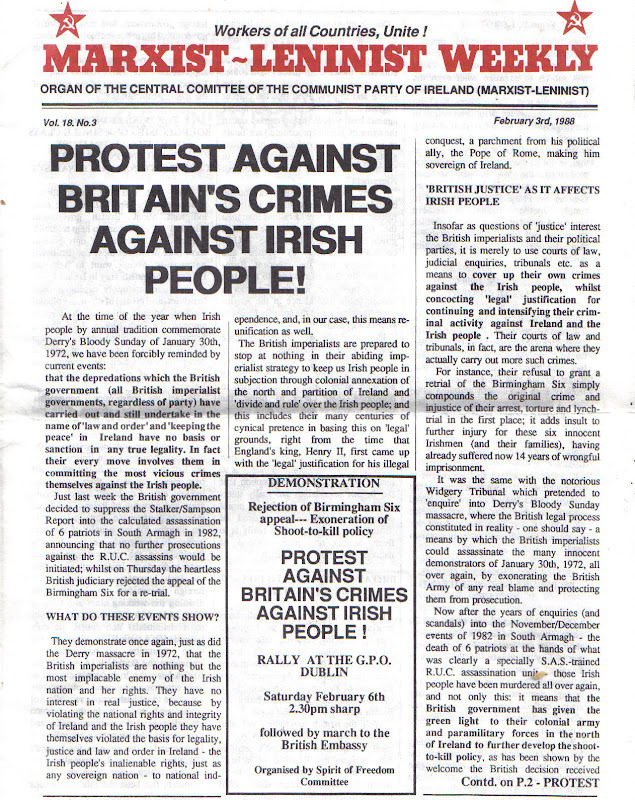 From the February 1982 General Election a leaflet from Communist Party of Ireland (Marxist Leninist) candidate Rod Eley running in Dublin West where he polled 59 votes. 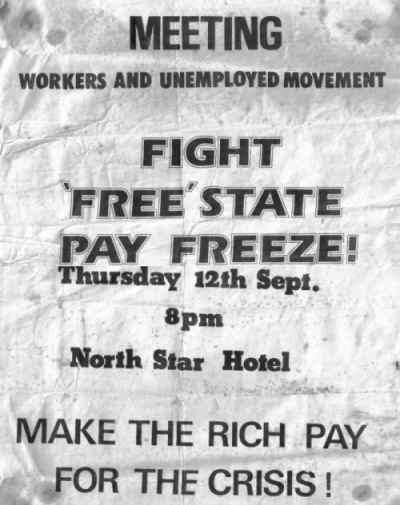 This is a poster, I had at home, advertising a meeting to be held on the 12th September 1985 against the ‘Free’ State pay Freeze. A public sector pay freeze had been announced and the ‘Workers and Unemployed Movement’ had organised the meeting. During that period the North Star Hotel was a regular venue for such meetings, it appears to have fallen out of fashion these days. The Blue Tac marks in the corners are due to it being hung on my bedroom wall for a number of years. The ‘Workers and Unemployed Movement’ was part of the Communist Party of Ireland (Marxist-Leninist). Attached also in the post is the cover of Marxist Leninist Weekly dated September 4th 1985 giving a background to the meeting. Many thanks to Conor for taking the time to get that and helping me link the CPI-ML with the meeting. Thanks also to the others that helped make the link between the ‘Workers and Unemployed Movement’ and the CPI-ML . A copy of Marxist-Leninist Weekly from 3rd Feb 1988. Hits out at Britain and also Israeli Zionism. I’m not sure if this is the full version of the paper or a smaller pamphlet (Tabloid!) version of that weeks edition. I can only presume that the group organizing the advertised Rally and march to the British Embassy ,”The Spirit of Freedom Committee” was the CPI-ML in ‘disguise’. A theme that runs through a lot of the Irish Left literature I have and I’d imagine internationally.